The centerpiece of the Elbphilharmonie is also currently one of the most exciting structural projects in Europe: a world-class concert hall that is detached from the rest of the building to maintain excellent acoustics. 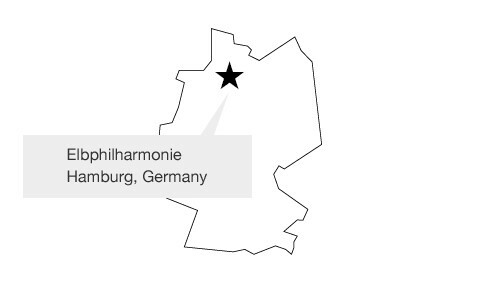 The team developed an algorithm specifically for the occasion, which translated the music played by the NDR Elbphilharmonie Orchester–the orchestra in residence at the Elbphilharmonie–under the baton of Thomas Hengelbrock. 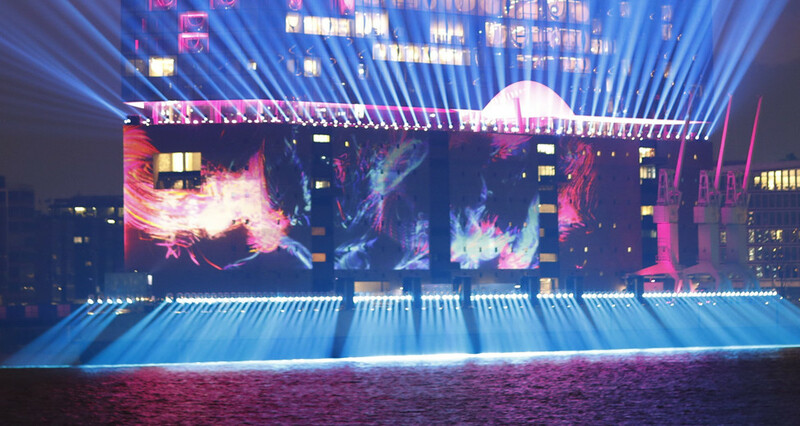 This matching of music and light created an impressive visual display on the exterior walls of the new cultural highlight of the harbor. "That the Music is Almost Our Generator for the Visual Images is a Beautiful Thing"
It captured the attention of the assembled audience, media and those watching the event on television and via a live stream on the NDR website. A total of 27 projectors with more than 800,000 ANSI lumens of light were used, resulting in a total resolution of 17400 x 2160 pixels. These were combined with more than 800 lighting fixtures. Twenty-four of the projectors were the new 31,000 lumen laser projectors from Panasonic, the PT-RZ31K. 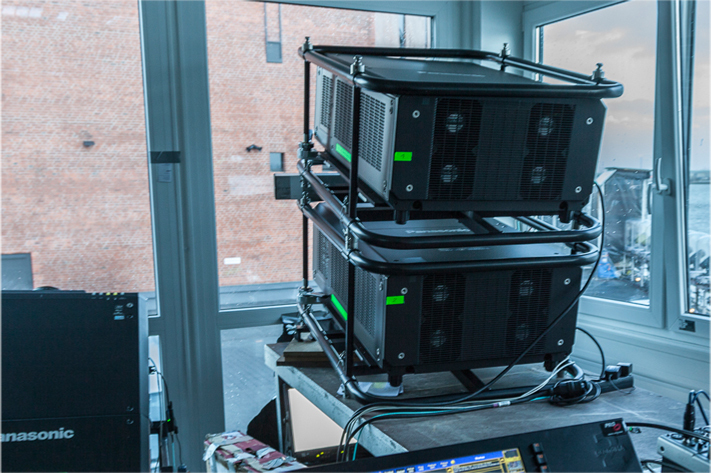 Marco Dunker, Video Project Manager at PRG, said, "We set up six towers. 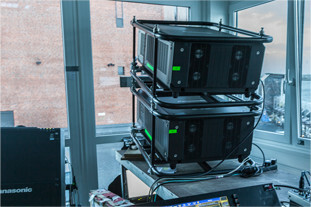 Each tower includes three Panasonic RZ31K projectors. These are new laser projectors, which are being used here for the first time. The whole system was connected via fiber optics. The servers were located in a container, which controlled the whole mapping, etc. and the design on the wall." Available in both WUXGA and SXGA+, the PT-RZ31K series is the brightest in the Panasonic range with an exceptionally compact and lightweight body harnessing powerful SOLID SHINE laser technology. In normal operation, the RZ31K is designed for 20,000 hours of maintenance-free operation. Hartmut Kulessa, European Marketing Manager at Panasonic, said, "This is a very high profile and prestigious project and we are delighted that Panasonic's projectors could play their part in making it so special. The launch of high brightness laser projectors, such as the PT-RZ31K, makes this type of event less complex and costly, as fewer projectors are needed to map a larger area. We believe that we will see more events such as this as a result." Jerry Appelt developed the lighting design for the event, using PRG Best Boys, Icon Beams, Clay Paky Mythos and over 500 SGM LED luminaires. The video-projection content was created by the Offenbach design agency Madhat. Michael Casper, Account Manager at PRG, said, "Particularly being a Hamburg-based company, we at PRG are naturally proud to be part of the opening of this unique building. We were commissioned to handle the technical implementation of the multimedia show. 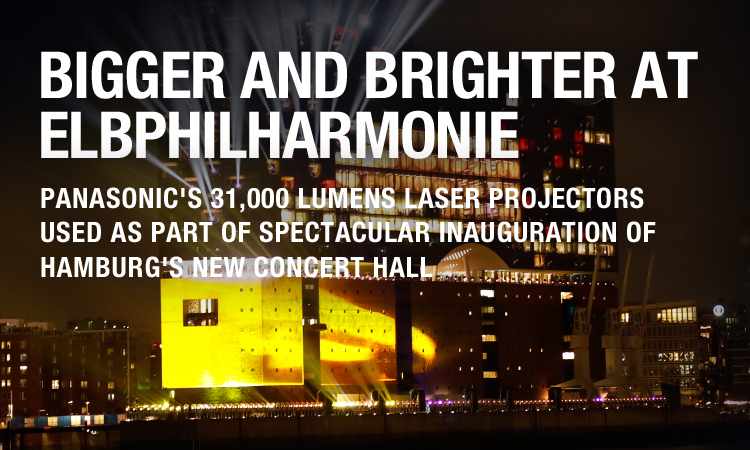 This meant creating a video projection on three sides of the Elbe Philharmonic Hall and using more than 800 moving lights." Lighting Designer Jerry Appelt, said: "I've been fortunate enough to have already done something like this once or twice in my life and all I can say is this: there'll be nothing like this again. And that's why I think this is something special. "Because it's appropriate to the occasion, but its implementation is also simply quite special. And then there's also the way in which the music is handled during the creative process; the fact that the music is almost our generator for the visual images. That's a beautiful thing in itself. You realize that everyone wants and is desperate to be part of this event, and that is why we are all pulling together."